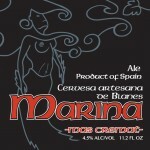 The Marina brewery is located in the beach town of Blanes, north of Barcelona. Founded by two brothers, the company hosts an annual beer festival each May on it’s hometown boardwalk. A dark beer with a persistent creamy head. Coffee, pepper and earthy notes in the nose that gives way to a light acidity in the mouth finishing up with more chocolate and coffee.